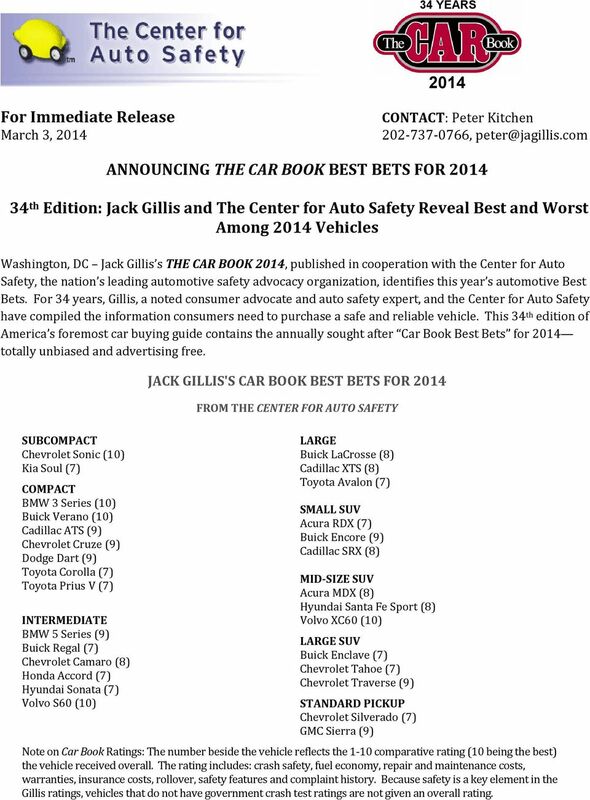 Download "ANNOUNCING THE CAR BOOK BEST BETS FOR 2014"
1 For Immediate Release March 3, CONTACT: Peter Kitchen , ANNOUNCING THE CAR BOOK BEST BETS FOR 34 th Edition: Jack Gillis and The Center for Auto Safety Reveal Best and Worst Among Vehicles Washington, DC Jack Gillis s THE CAR BOOK, published in cooperation with the Center for Auto Safety, the nation s leading automotive safety advocacy organization, identifies this year s automotive Best Bets. 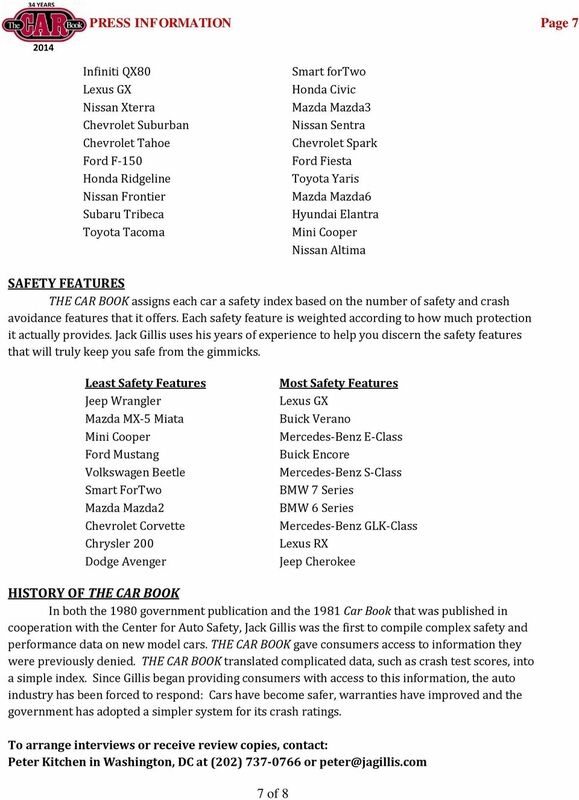 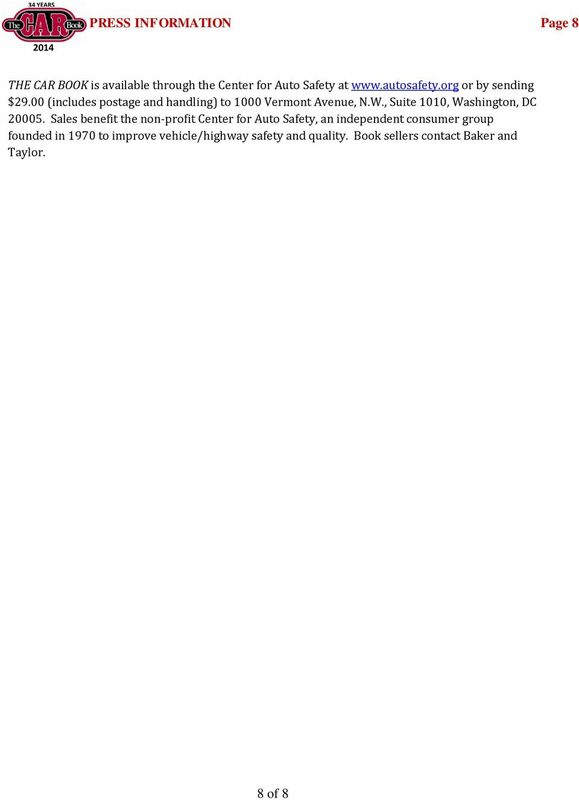 For 34 years, Gillis, a noted consumer advocate and auto safety expert, and the Center for Auto Safety have compiled the information consumers need to purchase a safe and reliable vehicle. 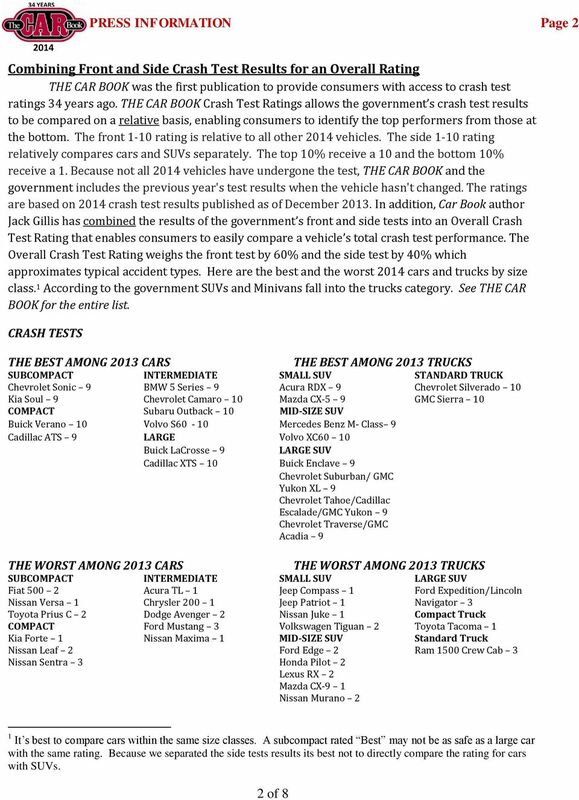 This 34 th edition of America s foremost car buying guide contains the annually sought after Car Book Best Bets for totally unbiased and advertising free. 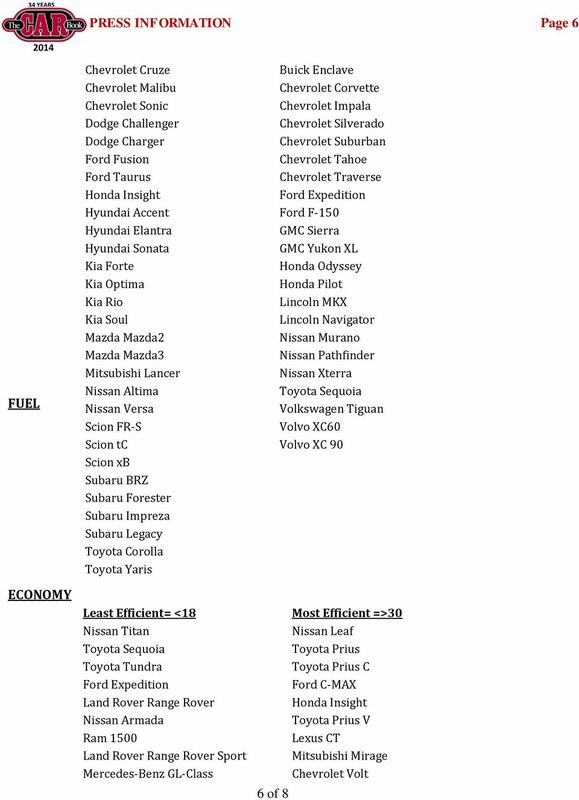 SUBCOMPACT Chevrolet Sonic (10) Kia Soul (7) COMPACT BMW 3 Series (10) Buick Verano (10) Cadillac ATS (9) Chevrolet Cruze (9) Dodge Dart (9) Toyota Corolla (7) Toyota Prius V (7) INTERMEDIATE BMW 5 Series (9) Buick Regal (7) Chevrolet Camaro (8) Honda Accord (7) Hyundai Sonata (7) Volvo S60 (10) JACK GILLIS'S CAR BOOK BEST BETS FOR FROM THE CENTER FOR AUTO SAFETY LARGE Buick LaCrosse (8) Cadillac XTS (8) Toyota Avalon (7) SMALL SUV Acura RDX (7) Buick Encore (9) Cadillac SRX (8) MID-SIZE SUV Acura MDX (8) Hyundai Santa Fe Sport (8) Volvo XC60 (10) LARGE SUV Buick Enclave (7) Chevrolet Tahoe (7) Chevrolet Traverse (9) STANDARD PICKUP Chevrolet Silverado (7) GMC Sierra (9) Note on Car Book Ratings: The number beside the vehicle reflects the 1-10 comparative rating (10 being the best) the vehicle received overall. 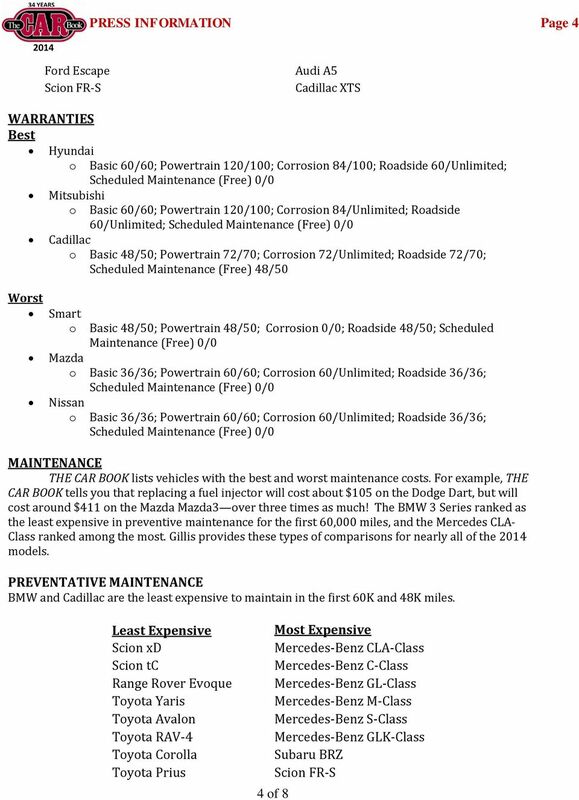 The rating includes: crash safety, fuel economy, repair and maintenance costs, warranties, insurance costs, rollover, safety features and complaint history. 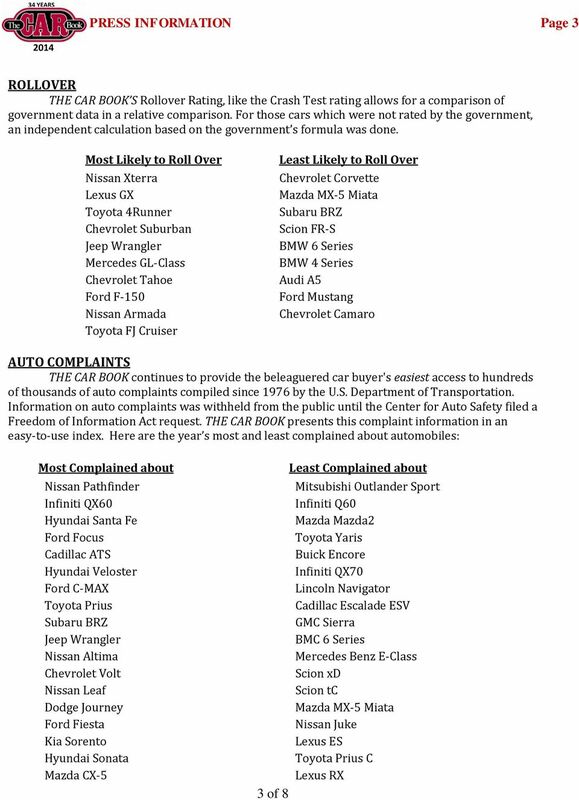 Because safety is a key element in the Gillis ratings, vehicles that do not have government crash test ratings are not given an overall rating. 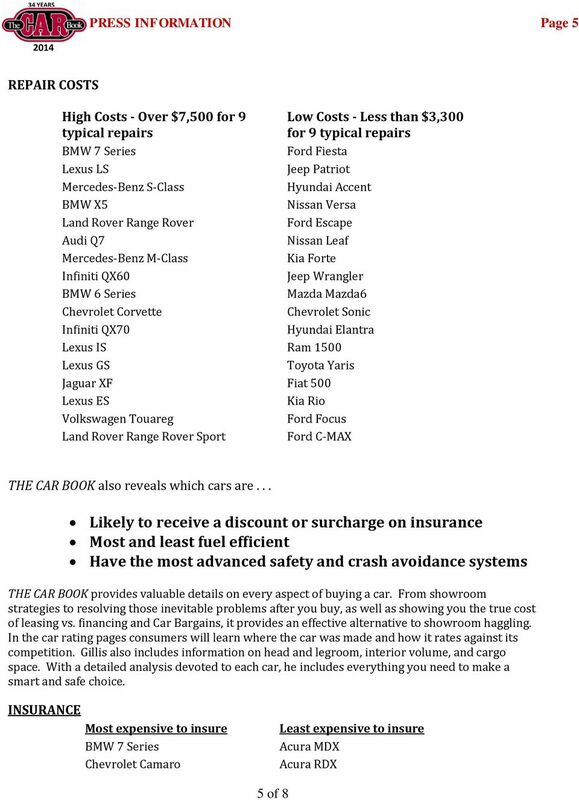 It is based on typical vehicles in various sizes available in Australia and provides an indication of the likely areas of expense.